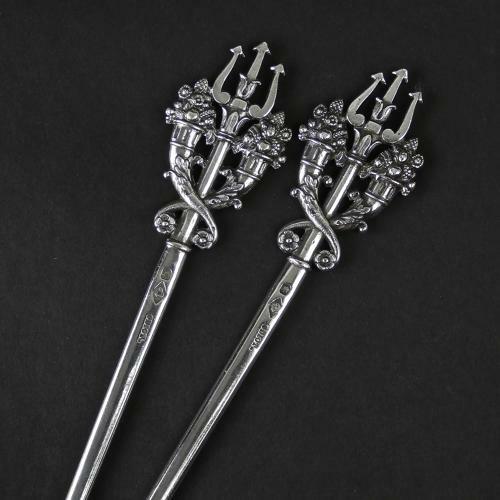 A fabulous quality pair of 19th century, French silver hatelet skewers. Both skewers are marked with a French silver hallmark and the name 'ODIOT'. Odiot is a leading French silversmith and the company was established in1690. These skewers date from c.1860. The design incorporates a triton with cornucopias filled with fruit to either side. The workmanship is very detailed and of the finest quality. They are both in excellent condition. Price includes postage with in the U.K. Shipping to the U.S.A. add £20. Western Europe add £10.